We departed Hong Kong for our next destination. It would turn out to be a short hop across the East China Sea to the Land of the Rising Sun – Japan (Nippon in Kanji). Our port of departure was not on land but actually an artificial island in Osaka Bay – Kansai International Airport. The Airport opened in 1994 to relieve congestion and is the third busiest airport in Japan. While waiting in line for immigration two signals told us we were definitely in Japan. Karen had visited Tokyo in 2006 backpacking and then again in 2012 for work so this was her 3rd visit to Japan. 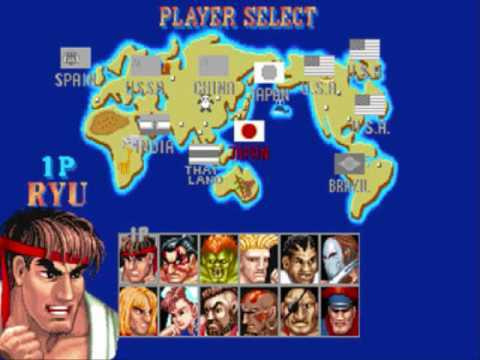 However this would be John’s maiden visit to the land of Anime and Videogames so he got to ‘Add a Country’. We made it through Immigration and Baggage Collection and followed the helpful signs and arrows to the Airport Railway Station. We would discover over the course of the next fortnight that this is the standard across all of the Japan so we would throw out our written directions almost immediately. There is an ‘English’ button somewhere..
Our train was a midnight blue Nankai 50000 series train and it got us all the way to Namba (50km away) in 37 minutes. From there it was a quick jump across to the Midnight Blue Yotsubashi Metro Line and before we knew it we had arrived at the very Kawaii Higobashi Station before checking into our accommodation, the boutique Hotel Cordia Osaka. And there was a package waiting for us!!! Our Pocket Wifi. 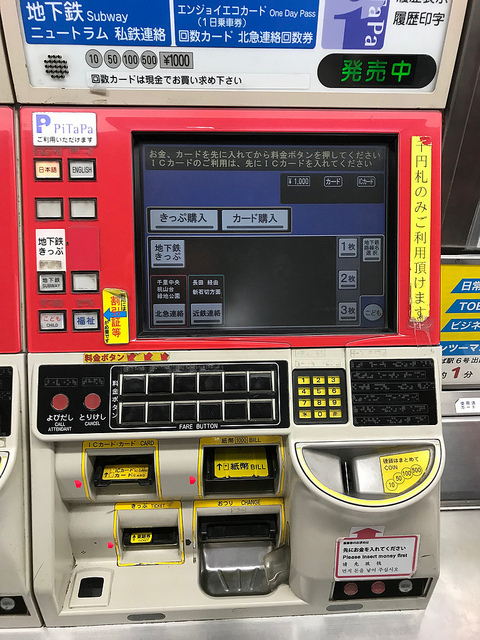 Japan Tip #1:To really uncover the best restaurants, check when an attraction is open and navigate some of these Metropoli – you need a good Internet Connection that is mobile. Pocket Wifi Dongles are very cheap compared to Roaming Charges and 1 device can be shared amongst multiple phones. Well worth the effort. We used one from Japan Wireless. We struck out into our new adopted city that first night. Looking for adventure, excitement and, oh yes, dinner! The only place for us was back down near Namba and an area called Dōtonbori. Named after the canal (bori) that cuts right through it, this is the heart and soul of Osaka Nightlife. From the legions of seafood restaurants to the neon glow on the water it would be a great place to start our immersion into Japanese culture. So as I said a ‘bori’ is a canal. But what is a Dōton? Doton was a man, Yasui Dōton, who came up with the idea to link two rivers in Osaka with a canal in 1612. Unfortunately he would not live to see it’s completion only 3 years later as he died defending Toyotami Hideyori in the Siege of Osaka (more on this later on). The victor of that Siege (on the opposite side), and new Shogunate lord of Osaka Castle,Tadaki Matsudaira, named the finished canal in Yasui’s honour. Thanks to urban planning shortly afterwards this area of the burgeoning city became an entertainment district that still lives on today. Culture Corner: ‘Kuidaore’ is a Japanese word for extravagance, specifically “to ruin oneself by extravagance in food”. It forms part of a proverb – “Dress into ruin in Kyoto, eat into ruin in Osaka” . Dōtonburi represents this culture. For dinner we picked one of the many restaurants and had a mixture of tempura and some Katsu Chicken. The restaurant had a long bar counter and tons of Baseball memorabilia on the walls (The Japanese are Baseball Crazy). Before we left Dōtonburi we stopped to take some photos of the famous ‘Running Man’ sign. This advertisement for confectionary company Glico has been here since 1935 and it is seen as a right of passage to get a photo in front of it. (The best spot is on the Ebisubashi bridge). This is the 6th version of the advert to feature neon lights and it gets a make-over during major events (such as the 2002 World Cup) from time to time. 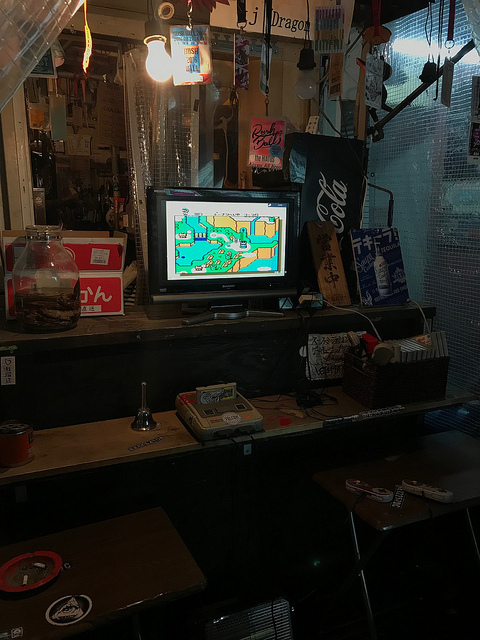 We strolled back to our hotel via the Amerikamura District and along the way encountered an inviting Super Famicom on the street. The next morning we decided to walk to Osaka Castle along the southern banks of the Yodo River, stopping for breakfast along the way at Northshore Kitahama, where we were able to eat out on the verandah overlooking the river. Kitahama and the wider Chuo Ward form the Financial District of Osaka. Nomura was founded in the city in 1925. There were many impressive office buildings, both sleek and modern and of the classic kind (e.g. The Osaka Securities Exchange Building). It also acts as a gateway to the centre island and buildings such as the Neo-Classical City Public Hall, which you can access by the Naniwa Bridge (‘Lion Bridge’) which has a foursome of Lions standing guard. (Similar statues to the Istvan Szechenyi in Budapest). It was while we were walking along the banks of the Yodo River that we had our first encounter with Sakura, or Cherry Blossom. We had hoped we might have an outside chance to see some as we had got our timing wrong and booked too early to normally catch it but due to warm weather over the winter. Lucky for us. The most prominent variety are the Somei Yoshino (White Cherry Blossom) but we did spot some Yaezakura (pink) trees as well. 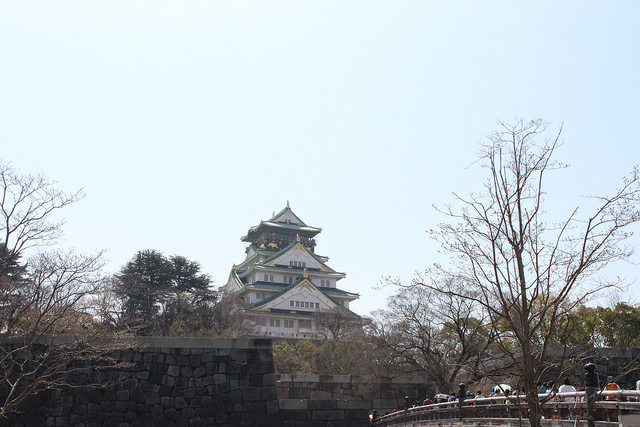 By the time the river had decided to turn north on us we had reached Osaka Castle. Not only is it a major landmark in the city of Osaka but it is here that a pivotal moment of the unification of Japan occurred in the 16th Century that led to the Siege of Osaka the consequence of which led to the main tower being set to fire and destroyed. Since then it has been destroyed and re-built four times due to a pair of lightning strikes against the gunpowder stores (1660 & 1665), conflict during the Meiji Restoration (1868) and Allied Bombing during World War II (1945). It was also destroyed fictionally in 1955’s Tohu Tokusatsu’s Godzilla Raids Again when Godzilla pins Anguirus to the Castle. Today we get to take in the 1997 restoration of the main tower to it’s Edo Era splendour. It was quite something to see up close, Surrounding the Castle is a very impressive 360 degree moat with high curtain walls. Within are grounds with Sakura Trees and the odd Samurai. The main Castle Tower is 5 stories tall (55 Metres) and painted in glorious white. A contrast to many stone-grey European castles. It is dotted with dazzling gold sculptures along its balustrades with fish tigers and tigers alike. After spending some time at Osaka Castle we got a shinkansen train around to the last district we wanted to explore in Osaka – Umeda. Umeda (or Kita) is the North district of the city. A major business centre in its own right, it’s shape and identity is in constant flux as the majority of Osaka’s redevelopment work is going on in this district. One of the key buildings is the Umeda Sky Building. It has an observation deck which is actually a bridge that connects the two towers that comprise the building. It was completed in 1993 and was meant to connect 4 towers but the Japanese Economic Crash of the 1980s reduced the construction outlook and now only two towers were completed. At 170 metres above ground (nearly 3 times taller than the Osaka Castle we had just visited) you were rewarded with a different take on Osaka City. The scale for one thing was crazy. Osaka is the 14th Largest Metropolis in the world with just under 18m inhabitants. (That is 3x the entire population of Ireland and is still 3.5m more people than London). If it was a city-state in it’s own right it would have the 67th Largest Population in the world. We would be taking the 5pm train to Hiroshima so we had enough time to wander back to Namba and get some lunch. Thanks to Google Maps we found one of the best Ramen joints (according to Forbes) back near Dōtonburi, Ichiran Ramen. Individual dining booths, Tokens from a vending machine and tasty Ramen. What more could you want? We had just about spent 24 hours in Osaka. It’s a very happening place. Plenty of modern nightlife co-existing with traditional Japanese Culture and so far it had the best Sakura and Food. Our next stop – Hiroshima had a lot of competition ahead of it. Great luck on the cherry blossoms! Yes it was. It would only get better as the trip progressed..
Great start (though I read your Hiroshima entry first!) to your reviews – looking forward to reading about the rest of your trip. You were lucky to encounter and early cherry blossom. Yes we were very lucky. I think we had it during our entire trip!